Will Ellingson and Rayna Bagchi, both Senior Class Gift coordinators, stand with Board of Trustees chair Nelson Carbonell, who matched the class’ participation rate with a $55,000 donation. More seniors than ever before donated to the University this year as part of the Senior Class Gift, but the total haul stayed about the same as last year. 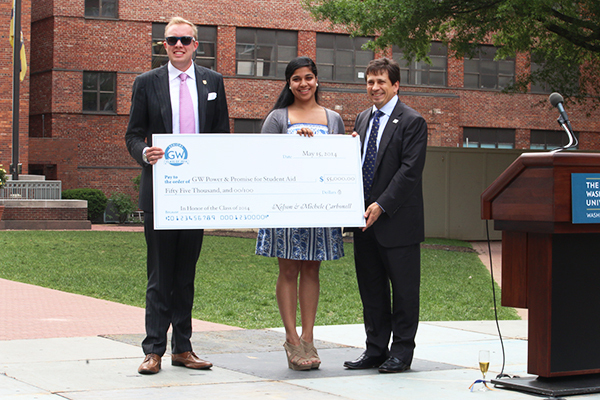 More than 55 percent of the senior class gave to GW this year, donating a combined $86,000, which student leaders announced Thursday during a champagne toast in University Yard. Chairman of the Board of Trustees Nelson Carbonell matched the class’ participation rate with a $55,000 donation, his fourth gift in as many years. Since 2010, he’s given more than $156,000 to the University’s financial aid fund for the Senior Class Gift challenge. “The participation challenge set by my wife Michele and me goes up every year – it’s just going to get harder,” Carbonell joked at the ceremony. The total amount in donations has leveled off over the past two years, after GW pulled in more than $90,000 in 2012. But administrators say increasing participation is more important than the number of dollars because having recent graduates in the habit of giving will help grow the University’s relatively small base of alumni donors. The University challenged this year’s class with increasing participation by 3 percentage points from the year before. That goal of 55 percent is a more than 10 percentage points increase from three years ago. An active base of alumni donors will be critical to the success of a $1 billion fundraising campaign that the University is preparing to launch. Alumni participation made up about one-third of total fundraising campaign hauls at 125 other colleges nationwide, according to report by the Council for Advancement and Support of Education. About 300 students agreed to give annually for the next five years, which administrators said shows that alumni will likely continue to give in the coming years. Provost Steven Lerman said annual gifts were a “good predictor” of future contributions, and he said they also point to a more engaged student body. More than 300 students donated to the campaign within the last week, said Rayna Bagchi, one of the Senior Class Gift coordinators. Last year, the campaign drew in the last seniors needed by midnight during Senior Night before announcing the total the next day. Bagchi also said the two most popular destinations for donations were financial aid and student organizations. Bagchi said GW likely reached its participation goal in the middle of the week, though she did not yet know the exact number of donors. Liza Floyd, an anthropology major, said she gave her donation to the University Honors program because of its impact on her time at GW. “It was the best part of my GW experience. I would not have given if I hadn’t been able to give where I wanted,” Floyd said. This article appeared in the May 15, 2014 issue of the Hatchet.